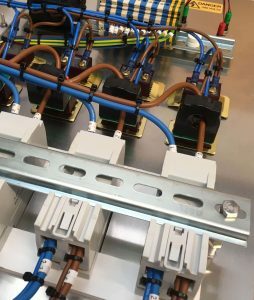 To accompany our panel production we offer full wiring facilities from panel wiring, as shown here, to looms and harnesses for ease of installation. 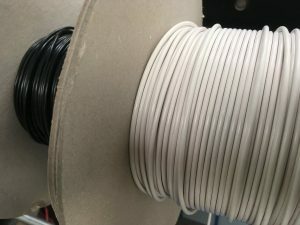 Many firms choose to outsource wiring to give them the benefit of knowing a component cost and to save holding component stock. We make one-off’s to production runs, mainly specialising in the marine industry and therefore using marine quality equipment such as Deutsch connectors. Each harness/panel is fully tested before despatch. 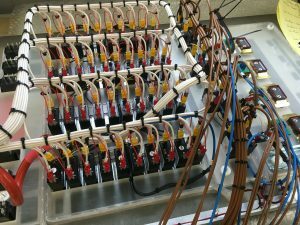 This is a fully wired AC/DC control panel being wired to a din rail system, this would be supplied with a wiring specification making installation easier and quicker for the boatbuilder. We label all of our circuit breakers with amp ratings on the rear, again to make installation and after sales work easier. Some boatbuilders also have the legends labelled on the rear of the panel. Using din rail style terminations we can identify by number both the cables and the rail. Deutsch have a very comprehensive range of multi pin connectors for use in harsh environments, giving a completely watertight seal. This range of connectors is used widely in both marine and offshore markets. We stock a wide range of YY and CY control cable and cable identification systems. 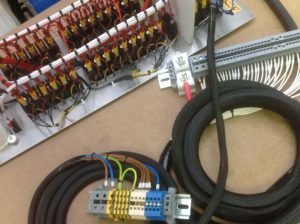 Our fully qualified electricians can make wiring looms to your requirements from single engine loom to a complete harness system.